SDP assures development in Kwara, as governorship candidate receives party flag – Royal Times of Nigeria. Social Democratic Party has officially been presented party flag to the Kwara state governorship candidate of the party, Doctor Olajide Adebola and his running mate, Abubakar Umir with a call on Kwara residents to vote massively for the party during the election. Presenting the flag to the candidates at the party secretariat, the Chairman of the party, Honourable Lekan Alabi emphasized the need for Kwarans to facilitate the emergence of doctor Adebola as the governor with their votes in the 2019 general election. The SDP Chairman who hinted that the party has been re-positioned to reclaim power come 2019, expressed confidence that the party’ s victory in the election would be a blessing to the state in term of economic development. Receiving the flag, Adebola said Kwara state deserves better and adequate employment, increase in Internally generated revenue, good health management, better road network, agricultural development among others. 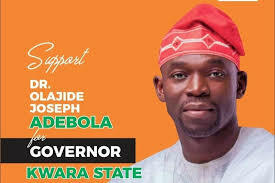 Adebola therefore assured kwarans of better infrastructural development, health, portable water if voted into office in the 2019 general election.